Pride House is a pop-up café and equality and human rights hub which will offer a space for LGBTI players, officials, community members and visitors. There are football, wider sports, cultural .and recreational events all on the programme. In particular, there are some key focus events looking at the intersections between LGBTI and homelessness and asylum. A spokesperson for the project said ‘We have worked with community members, groups and organisations to hear what is important, and we hope that we have been able to develop a programme that will allow people from all backgrounds and with a wide variety of interests to get involved’. The website has all events listed, and a downloadable version of the programme is also available. Pride House is wholly funded through community fundraising efforts and donations, and a crowdfunding campaign continues. Pride Houses are pop up spaces at global sporting events which create a space for lesbian gay bisexual transgender and intersex (LGBTI) people to engage with and celebrate the event, to explore LGBTI issues in sport, and to build relationships with mainstream sport. 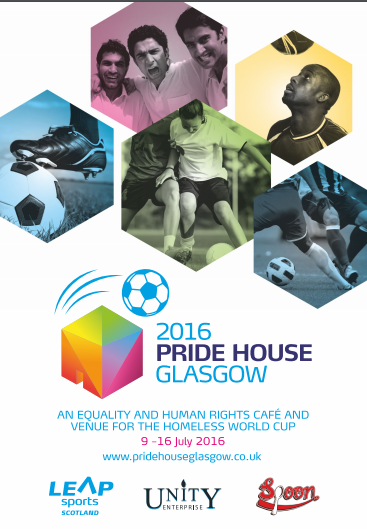 Pride House Glasgow 2016 is being run as a partnership between LEAP Sports Scotland and Unity Enterprise. Written on 4th July 2016.